For many homeowners, maintaining a lush front lawn is more than a luxury, a symbol of pride and status. After all, your garden is essentially the face of your house. And just like our own faces, our front lawn can speak volumes about ourselves. In that sense, the least we can do is keep the grass green and the plants watered and fed. Unfortunately, preserving a healthy lawn can require specific tasks and preparations; some of which may not agree with our budget at times. Periodically fertilizing your garden and plants is one of the most important steps of lawn maintenance. However, some fertilizers can be really heavy on your wallet, especially if you have a big lawn to fertilize. But does fertilizing your garden really need to be so expensive? With so many products in the market for this purpose, surely there must be a cheap lawn fertilizer that offers both quality, and affordability, right? If you are struggling to find an inexpensive supplement for your garden, then this article is for you. Below are our personal picks for best grass lawn fertilizers under $10. Pacific Sod has been working in the agricultural industry for more than 100 years now. They started out in 1951, with their main headquarters located in Southern California. Throughout the years, this company has been in charge of producing some of the highest quality products in the country, which include soil amendments, fertilizers, turf builders, and grass starters, among others. This product contains a well-balanced NPK ratio of 16-20-0. The high amounts of nitrogen will promote leaf growth in every single blade of fertilized grass. While the phosphate and sulfur, content will stimulate the growth of deeper and stronger roots, which translates into an increased ability to absorb nutrients from the soil. In short, with the use of this product, your grass will be as strong and green like never before. Scotts is a brand of the Scotts Miracle-Gro Company, which is the biggest lawn and garden product manufacturer in North America. This organization has a significant presence in the United States, Canada, and most of Europe. Scotts produces some of the highest quality products for lawn care, so don’t be surprised if the next items in this list are manufactured by them. This product comes packed with lots of nitrogen and phosphorus, as well as small amount of potassium. The mix of these 3 macronutrients is the recipe for creating a lush, green and strong patch of grass. In case you’re wondering, the NPK contents of this product are 24-25-4. 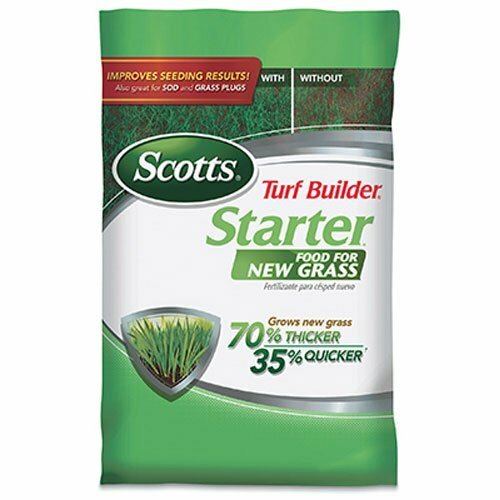 This one is also manufactured by Scotts, and this time around we have a product that can help you grow a lush patch of grass in record time. 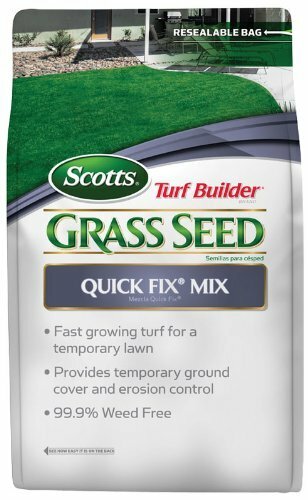 The Scotts Quick Fix Mix is meant to promote lightning-fast growth of temporary grass: When the product says temporary grass, it’s because the new turf is not meant to live beyond one year, which makes it perfect for preparing the lawn for special occasions, such as when selling the house, or a special celebration, etc. The product doesn’t actually reveal its contents, but we’re guessing it might contain grass seeds, as well as soil amendments and fertilizers to speed up the growth of the seedlings. This product was manufactured for those homeowners that are constantly battling with nasty and unsightly weeds growing alongside their grass. This fertilizer has an NPK ratio of 28-0-3, which is meant to feed your grass during the various stages of development. It is also supplemented with Scotts WeedGrip Technology that removes all the weeds from your lawn, both the ones that are visible, as well as the smaller, harder to see variants. 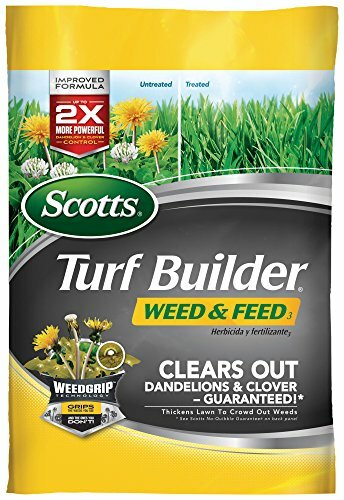 This product is great for those who are having issues with clovers, dandelions, crabgrass, and other types of weeds. For its quality, this one is definitely one of the cheapest fertilizers for grass in the market. Last but not least, Scotts marvels with, yet again, another high quality product for growing grass. 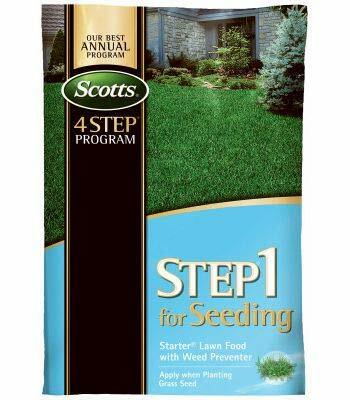 This product was created to help you grow a strong patch of grass from scratch. It contains a blend of fertilizer, with enriched lawn soil that can help both amend your lawn’s original soil, as well as enrich it to produce a stronger, greener patch of grass. This one is perfect for those that want to start a front lawn but have unhealthy or mostly uninhabitable soil. This product will breathe new life to your lawn, and allow you to create that green garden you’ve alway wished for. By now you might have noticed that many products on this list show 3 numbers separated by hyphens. This group of numbers is known as the NPK contents of the product and are indicators of how much nitrogen (N), phosphorus(P), and potassium (K) it will offer your plants. These three elements are the most important nutrients for virtually any plant’s growth and health. 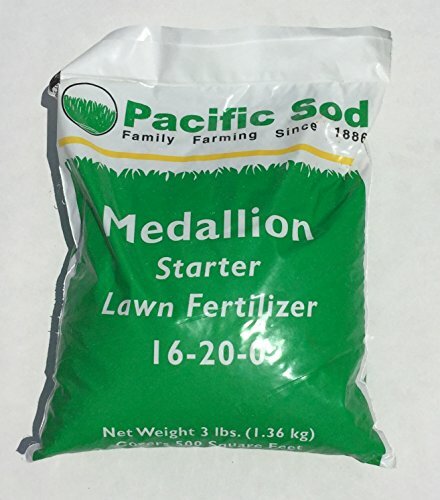 As a general rule of thumb, when trying to grow a patch of grass, you should look for a fertilizer with high amounts of nitrogen and phosphorus. These two are useful for promoting the growth of the grass’ leaves and roots, respectively. Potassium is used more on flower and vegetable plants since it increases blossoming and fruit production. If you are already happy with how your lawn looks but are struggling to keep the weeds at bay, then you might want to invest in a fertilizer with weed killer, such as our third entry. Your grass will thank you, and you will be happier to see your weed-free front lawn. I know this list might seem like a sales pitch for Scotts products. But in all honesty, you will be hard-pressed to find a company that sells high-quality products, at affordable prices. In this sense, Scotts offers all its clients the cheapest fertilizers to grow a green and lush garden, without breaking the bank in the process.